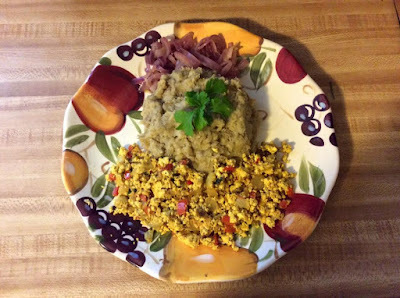 A Dominican traditional plate with a vegan twist, that will leave you wanting more. This was made for breakfast but was eaten for dinner. above are not set in stone, you can experiment with your own flavors, this is what cooking is about. However if you desire to obtain the appearance of eggs, turmeric is essential for color. Drain the tofu of its water with either a tofu press, or by wrapping it in paper towel and setting something heavy on top. Bring water to boil for the plantains. Make sure to season the water with salt as this not only adds flavor but quickens boiling. Once boiled, add peeled and quartered plantains and boil until you can easily poke a fork through, much like boiling potatoes. While tofu is draining, sauté sweet onions until translucent and slightly golden, add red peppers and continue sautéing for about 3 minutes. Add seasonings and crumble the tofu in the pan soon after. Be sure to mix well to incorporate all the flavors nicely. Sauté until most of the water from the tofu is cooked out and the turmeric has turned the tofu into that nice yellow color. Set aside. Sauté red onions for garnish in separate pan with olive oil and lemon. Drain boiling water from plantains. With a potato masher, begin to mash plantain with olive oil and salt until creamy consistency is reached. A tip to get that creamy consistency is adding just a little cold water. Somehow this reacts with the plantain and makes it easier to mash. Thinly slice green onion and sprinkle on tofu plate and serve.